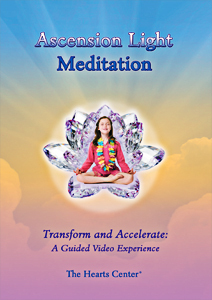 Through this Ascension Light Meditation you can experience the action of the violet laser light, as pure loving, transmuting forgiveness and mercy. You can have the flow of ascension currents through you, accelerating your atoms and electrons. Experience this high frequency light blazing within and feel a heightened awareness of your Real Self. Begin to understand what it means to ascend. Breathe, release, and let go permanently. Accept your new Selfhood for this alchemy to be sustained and to be 100% vitally effective for your ongoing life. An amethyst angel will guide you and assist at the deepestlevel of your being to make permanent this blessing and magnificent action of acceleration and transmutation. 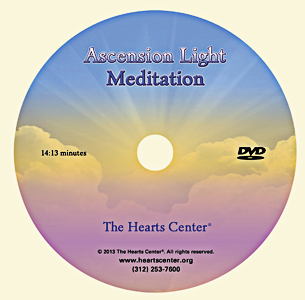 This Ascension Light meditation is a gift from the heart of Master Afra with Saint Germain. It was released through David Christopher Lewis, messenger for The Hearts Center, in 2012 before a gathering of heartfriends in Detroit. Now Master Afra, by the grace of God, with Saint Germain, sponsors the lowering of a replica of the Ascension Fire Chair into manifestation over you. Re-experience the bliss of this magnificent alchemy as often as you choose to enter into this divinely inspired meditation.